Branded By is master in the field of rustic stump and dinner candles. Characteristic of their product is the diversity of colours, burning hours, and fire quality. 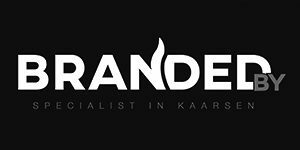 In addition to their extensive range of candles, Branded By offers a collection of tealight holders, candlesticks, and trays for the perfect product combinations. All Branded By candles are made with care and are of European origin. Only the best quality raw materials are used to produce these high-quality products and that is what this collection also shows!